free, single gender public charter school held a community meeting and celebration at the Legends Center on Soutel Dr. The meeting was held to discuss the vision of the school and the next steps to formulate an impact on the Jacksonville school system while providing a college prep education to the youth of the city. The goal of the new school is to assist the students in becoming critical thinkers and life-long learners. Their listed priorities are a direct response to community concerns and the meeting shared their vision and informing the community at large about the vast plans underway. Targeted enrollment of the charter school is 175 students with a maximum enrollment of 225 students and their school schedule will mirror the Duval County academic calendar year Valor 9th grade students will attend school from 8 a.m.
3 p.m. and elementary students will be on campus from 8:30 to 3:30 p.m. Valor Academy Director of Community Engagement Ywana Allen welcomed the community to the event and advised, Valor Leadership Academy staff will promote a holistic approach to learning and individual performance. Staff will be involved with the parents. We will visit the students homes and sit with the students and the parents to gage their long-term educational goals, she said. Instilling ethics early on, Valor students will participate in a trailblazers ceremony where students will understand the importance of the trailblazer jacket which they can earn based on accountability, pride and responsibility. Also, over time extracurricular programs will be added to the schedule. Valor Academy is currently holding openenrollment for grades 6th and 9th grades. Down the road Valor will enroll 7th and 10th graders and eventually will become a K-12 school. The school is located at 4819 Soutel Dr. For more information call 469-8195 or visit www.valoracademyjax.org. Deborah K. Thompson Ms. Senior Jacksonville Deborah K. Thompson was crowned Ms. Senior Jacksonville last weekend at Florida State College in Jacksonville, The pageants purpose is to inspire and recognize women aged 60 and above giving them a platform to dispel the myths of aging, increase their visibility in our community and create and build new friendships. For the next year, Ms. Senior Jacksonville will connect with nursing homes, senior centers and businesses sharing her platform to inspire women to exercise daily as they age. A successful entrprenuer, this years winner is owner of Deborah K. Thompson, Consultants where her company forges alliances between small and minority owned businesses and larger corporations and government entities. During Deborahs reign as Ms. Senior Jacksonville 2014, she will connect with nursing homes, senior centers and businesses sharing her platform to inspire women to exercise daily as they age. Deborah K. Thompson Crowned 2014 Ms. Senior Jacksonville Brotherhood of Police Officers Honor Deserving Students with Scholarships Valor Academy Aiming to Change the Path of Young Black Males Shown (L-R) are Carleton Jenkins II, Brian Jefferson II and DeMarius Potts Pictured at the meeting left to right are Osa Lampley, Zion Lampley, John Taylor, Rico Dawson, Paul Cook, Cameron Johnson, Alton Massaline, Alberta Bowden, Sharika Dawson, Jennifer Smith, Darnell Robertson, Valor Academy Chief Executive Officer Tunji Williams and Valor Dean of Scholars Rashid Williams. 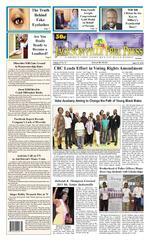 CBC Leads Effort in Voting Rights Amendment Not even the Supreme Court can stop the Congressional Black Caucus from moving forward in its mission to protect AfricanAmerican voters and others at the polls. Rep. Marcia Fudge (D-Ohio), led a contingent of caucus members and several minority groups in a public plea to Republicans on June 18 to take up legislation that would restore the voting rights protections shot down last year by the nations highest court. Voter discrimination is real in America, said Fudge, 61. We have a voting rights bill that has been sitting in the House for months and months and its being held up by Chairman Bob Goodlatte. The Congressional Black Caucus (CBC) and other Democrats have urged lawmakers to update the 1965 Voting Rights Act. In 2013, the High Court voted to strike down key components of the law, including allowing nine states to change their voting requirements without advance approval from the federal government. Fudge and other Democratic legislators said Goodlatte, (R-Va.), who serves as the House Judiciary Chairman, has blocked efforts to get a bill passed that would restore portions of the law that the Supreme Court struck down. Democrats are seeking greater protection for minority voters and they want to ensure that individuals arent turned away from the polls because they dont have proper identification or for other reasons. Goodlatte, 61, has vowed to protect voting rights. I fully support protecting the voting rights of all Americans, he said. As Congress determines whether additional steps are needed to protect those rights, I will carefully consider legislative proposals addressing the issue. However, with June quickly coming to a close and legislators preparing to return to their home states for summer break, without a resolution Congress would be hard pressed to pass a bill prior to the November midterm elections. July 3-9, 2014 Ms. Perrys Free Press Page 5 FOR THE WEEK OF JULY 1 7, 2014COACHING LEGEND ED TEMPLE FETED; NEW ADs AT HAMPTON, ALCORN STATEDOUBLE DIPS: HBCU products Jeffery Henderson (top, Stillman) and Francena McCorory (bottom, Hampton) win USA Track & Field titles.NATIONAL CHAMPSUSATAF Photos BCSP NotesNorfolk State's Pendarvis Williams on Houston Rockets Summer League team NORFOLK, Va.
the other taking place in Orlando. Kyle O'Quinn competed with the Orlando Magic in 2012 MARSHALL NEW HAMPTON AD: HAMPTON, Va.
men, women or children. It reads: As I begin this journey, I know I will feel excitement and energy as well as fear and frustration. I trust that your Divine love is encouraging and forgiving. I believe that true success starts with a richness of spirit. Please enter my heart and help my faith to grow stronger every day. When it is as small as a mustard seed, show me how this tiny treasure can create a forest. When my faith is as huge as a mighty oak tree, help me have the humility to see every small, helpless creature in its shadow and offer nourishment, shelter, and shade. Growing successful is my earthly goal, but growing in faith will remain my spiritual mission. One of my lowest points took place a couple of years ago; I was sick with diabetes, weak; work wasnt steady and I couldnt make ends meet; I had to use a food stamp card for six months, a first for me at age 60; I got help from my sons regularly however, food stamps had always been considered an embarrassment in my family! During my tough times, I kept my faith strong, and read my Bible daily, woke up early each day and prayed and meditated, picturing my life as a working woman again and in good health. I turned my television off, and instead listened to Les Brown, Zig Ziglar, Wayne Dyer, Joyce Meyer, Bishop T.D. Jakes, and Louise Hay. I had to strengthen myself from within. It worked, Im no longer a diabetic; and my finances have greatly improved. You can make it against all odds as well. The Religion Corner: Making It Against All St. Thomas Missionary Baptist Church Youth Revival Stop! Look! Listen! St. Thomas Missionary Baptist Church invites the community to their annual Youth Explosion, Saturday, July 12th, 9:45 a.m. to 2 p.m., and Sunday, July 13th, 8 a.m. and 10:45 a.m. worship services. The Revival will conclude with a three day youth revival Monday through Wednesday, July 14-16 at 7 p.m. at the St. Thomas Family Life Center, 5863 Moncrief Rd. Come and support our youth! For more information email blessedlisa3@hotmail.com.Abyssinia Missionary Baptist Hold Family, Friends and Community Day Abyssinia Missionary Baptist Church Family, Friends and Community Day Event will take place Saturday July 19th at 10 a.m. with Sr. Pastor W. Diamond. The free event will be held at 10325 Interstate Center Dr and is open to the public. This year, Abyssinians efforts will provide visitors from the Duval and surrounding counties an opportunity to enjoy an amazing day of free food, fun and fellowship in the sun with an array of outdoor activities for the entire family. Attendees will have an opportunity to enjoy live entertainment, vendors, give-a-ways, compete for cash prizes and tour Abyssinias New Generation of Excellence state of the art Youth Center. For additional information call the church at 696-1770 or email abyssiniaevents@abyssinia.org or visit online at www.abyssinia.org.Faust Temple Church Fun DayFaust Temple Church of God in Christ will be celebrating their annual fun day for the church and the community, Saturday, July 28th, from 10 a.m. to 2 p.m. Enjoy free food, games, fun and more fun! For additional info call the church office at 353-1418 or visit www.fausttemple.org. Bishop Edward Robinson Sr. and Lady Cynthia Robinson  Walk in my Shoes  Communitywide Shoe DriveWalk in my Shoes is a Communitywide Shoe Drive to collect 3,000 Bags of gently worn shoes for needy families. You or your organization can help by collecting at least one plastic bag containing 25 pairs of gently worn shoes per bag. All sizes, styles and color shoes for men, women, boys, girls will benefit the Adolescents Choosing Excellence Youth Programs. The Shoe Drive is July 1st to September 1st. For more information and bag pick-up call the Women of Color Cultural Foundation at 683-1757 or email helen.jackson4@comcast.net. Page 10 Ms. Perrys Free Press July 3-9, 2014 Weekly ad in hand. Coupons in pocket. BOGO-vision on. Its time to save.publix.com/save In His ew Book, Marion Barry Says His Story Is One of Second Chances Marion Barry, the four-time mayor of Washington, D.C., and current city councilman, doesnt shy away from the best-known scandal of his life. In fact, he speaks about it directly and forthrightly in his new book, Mayor for Life, discussing the event that catapulted him into international celebrity, when he was videotaped in 1990 smoking crack cocaine and subsequently arrested by FBI officials. It wasnt difficult to write that in the book, Barry said, in an interview with BET.com. I decided to tell the truth and the truth doesnt hurt anybody. Barry added, I felt very comfortable. I felt that, if I told my story of what I was going through for those two years of alcohol and drugs that I could be an inspiration to thousands and millions of Americans who are going through the same thing. More than anything, Barry describes his life, particularly after his high-profile troubles at the Vista International Hotel, as a story of redemption. After his legal problems, he was elected to the Washington City Council in 1992 and was elected again as the citys mayor and served from 1996 to 1995. Since 2002, he has served again on the city council of Washington. I have apologized to Effi, Cora, he said, referring to his ex-wife Effi Slaughter and his current wide Cora Masters. I have apologized to my son, Christopher. I apologized to the people of the District of Columbia. This is a city and a country of second chances. The people of Washington have forgiven me. They know about my good deeds and therefore Im loved by a lot of folks in this city. In the interview, and in the book, the onetime mayor who was born in Itta Bena, Mississippi, speaks proudly of the economic transition that has come to much of the nations capital, much of it under his mayoralty. Specifically, he said he is particularly proud of the fact that African-American owned businesses received 3 percent of D.C. contracts when he came into office. When he left the mayors office, he said, that number had risen to 47 percent. He said he is proud of a number of his accomplishments in office, too many to name. Im proud of the programs for our seniors and young people. But the big one is the development of downtown, he said, adding that he spoke with the largely white business leaders and developers to bring new life to downtown. Downtown is developed now. When I came in 1965, it was a complete southern town." The main purpose of the book, he said, is to provide facts about his life. This book is to set the record straight about the things I have done. The Vista is just one aspect of my life. I did a lot of fantastic things and overcame a lot before the Vista and after the Vista. Last week Congress presented the Congressional Gold Medal to the Rev. Martin Luther King, Jr., and Coretta Scott King, posthumously honoring the nation's most prominent civil rights hero with Congress's highest civilian honor. The ceremony took place in the Capitol rotunda, where Congress's top leaders expressed their admiration the first family of the civil rights movement for dedicating their lives to fighting injustice. Reps. Nancy Pelosi (D-Calif.), the House minority leader, and Marcia Fudge (D-Ohio), head of the Congressional Black Caucus, both used the stage to urge GOP leaders to consider legislation updating the Voting Rights Act, which the Supreme Court gutted last summer. Rep. John Lewis (D-Ga.), himself a hero of the civil rights movement, also spoke at the event highlighting the message of nonviolence underlying the Kings revolution of ideas. The ceremony, which also marked the 50th anniversary of the Civil Rights Act the Kings' advocacy had helped to pass, was a long time coming. A decade ago, Congress passed legislation presenting the Congressional Gold Medal to the Kings. The honor was posthumous for King, who was assassinated for his activism in 1968; his wife, Coretta, was expected to accept the award on the couple's behalf but became ill before the ceremony could take place. She died in 2006. An updated bill, sponsored by Lewis, was passed unanimously by both chambers of Congress earlier this year. President Obama signed it into law this month. They were my friends, Lewis said, my brother and my sister. All of the King children were in Washington to receive the Congressional Gold Medal and to recognize their parents role in the landmark Civil Rights Act that was signed into law on July 2, 1964, by President Lyndon B. Johnson. It will be transferred to the Smithsonian Institution. Martin Luther King III said his parents would be pleased with their receiving the medal. I think they would be deeply honored, he said. In an interview, he also added his parents more dominant feeling would be their frustration over what has happened with voting rights in the United States and the wave of new voter identification laws and efforts to make it more difficult for people of color to cast ballots. As we are observing this anniversary and receiving these awards, which are wonderful, my focus is on the larger issues, said Martin Luther King, III. Im sick of singing 'We Shall Overcome.' I want us to be able to sing, 'We Have Overcome.' When we fix our voting system, that will help. We can and we must do a better job. Kings Posthumously Awarded Congressional Gold Medal Martin Luther King III and his daughter shakes hands with a senator as Dexter King looks on at the medal ceremony Pictured left to right are comedians Lady AJ, Jason Granger, Dee Wilcox (Executive Director of the AnnieRuth Foundation), Ozrick Cooley, Ms. Gin and AJ Jackson.Comedians Tickle Funnybones for a CauseThe Kings & Queens of Clean Comedy show took place Saturday, June 28 at Abyssinia Missionary Baptist Church. Hundreds were entertained by local and world renown comedians. Proceeds benefited the AnnieRuth Foundation, a non-profit organization whose vision is to be a catalyst of positive change in underserved communities.